This lovely Liberty fabric is part of the 2015 Spring/Summer line. It features a watercolor rendition of flowers commonly found in an English garden’ Fox Gloves, Blue Bells and Penstemon in shades of periwinkle, purple, and orchid pink. 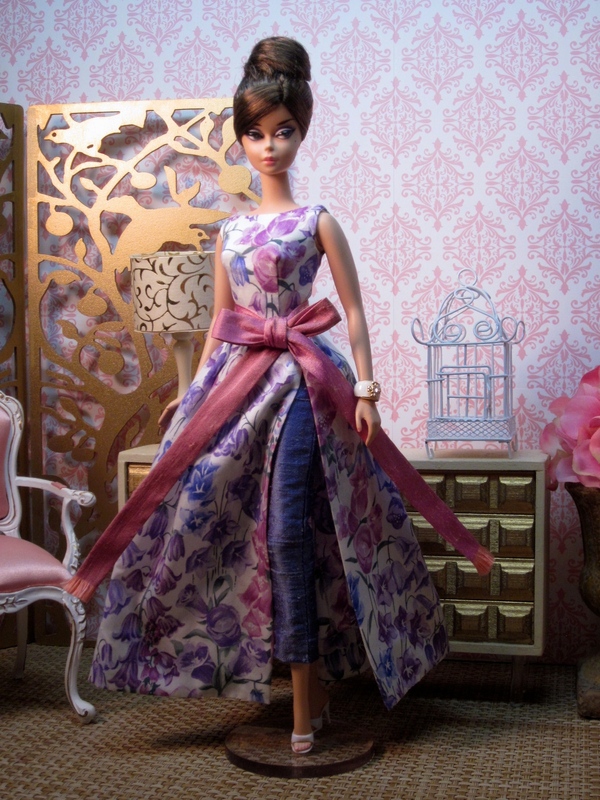 The full skirted gown is open on one side to reveal the slim trousers in dark periwinkle blue silk. 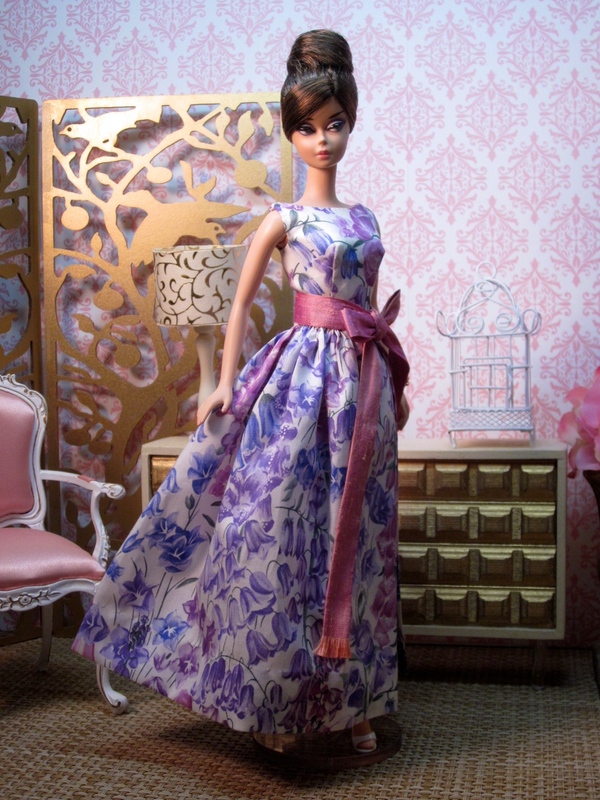 A hand fringed sash in orchid pink adds interest to the waist. 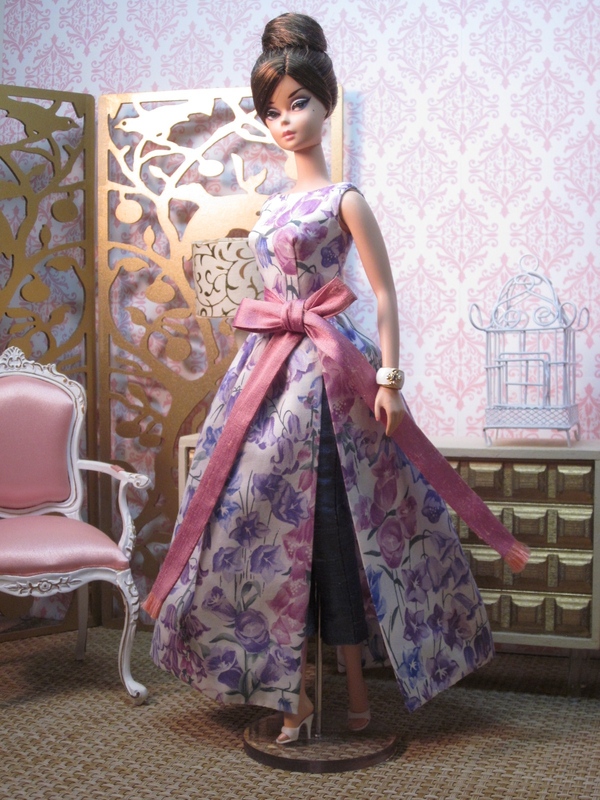 This fashion fits most 1/6 scale dolls, although the length is best suited for Victoire or Silkstone dolls. The pants may not fit dolls with broader hips such as FR2 or Severine/Lalka. The “Mannequin Mavens:” A collaboration from the creative minds of Hilda Westervelt and Maryann Roy. 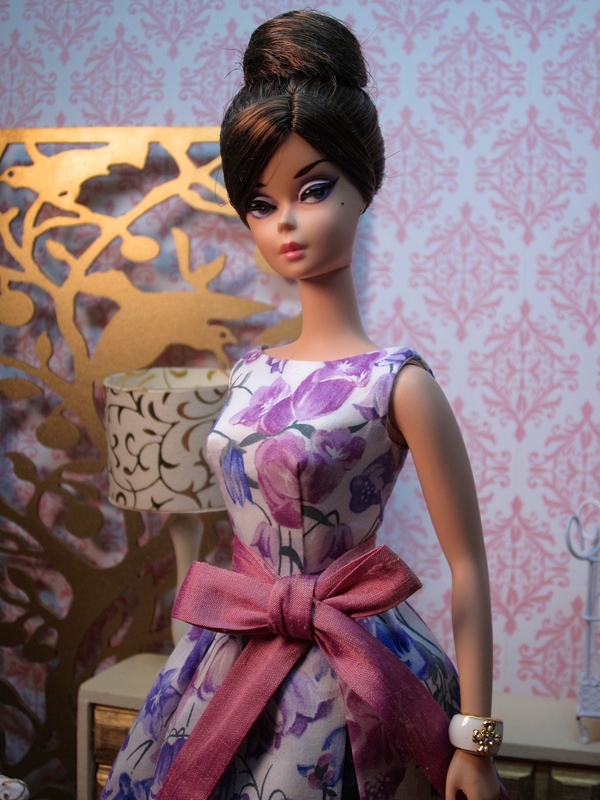 Maryann Roy and I love to collaborate on projects, so when I pitched the idea of doing a line of One of a Kind dolls, Maryann was as excited as I was. 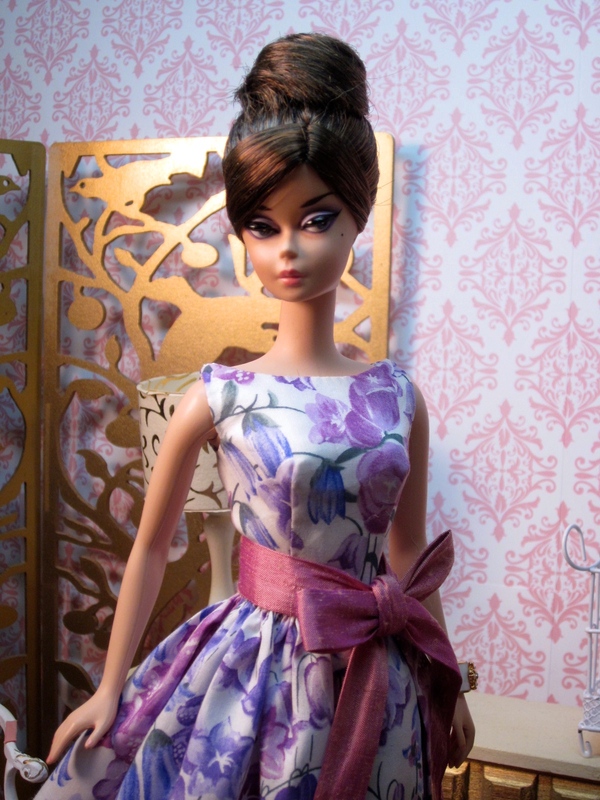 We premiered a collection of 8 dolls at the Barbie Convention last week. One was in the Raffle Room, one was in the Silent Auction, and 6 were for sale. This beautiful girl is the last of them and we are now offering her for sale to our online customers. 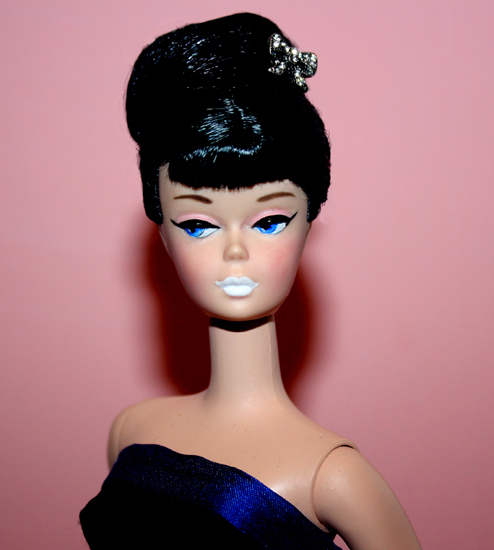 This dark haired beauty has a seductive gaze, with dark blue eyes, and stylish white lipstick. 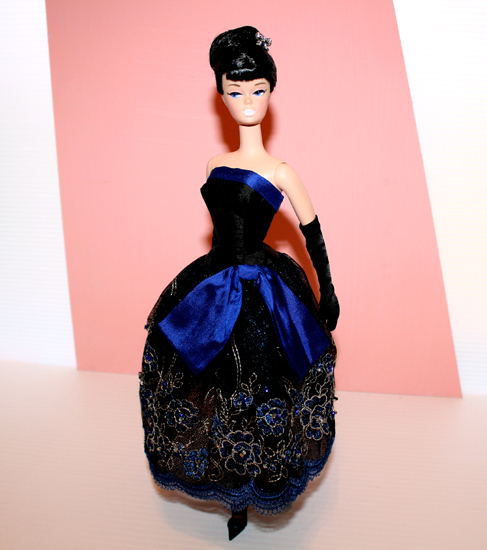 Her jet black hair has been swept up into an elaborate beehive, decorated with a diamante bow hair pin. Her cocktail gown has a black silk, dropped waist bodice. The bodice is defined by a band of sapphire blue silk. The full skirt is made of black, point d’esprit net lace, embroidered with sapphire flowers. The flowers are hand beaded with tiny jet and sapphire beads for sparkle. The underskirt if multiple layers of black tulle with sapphire glitter that shines through the lace. 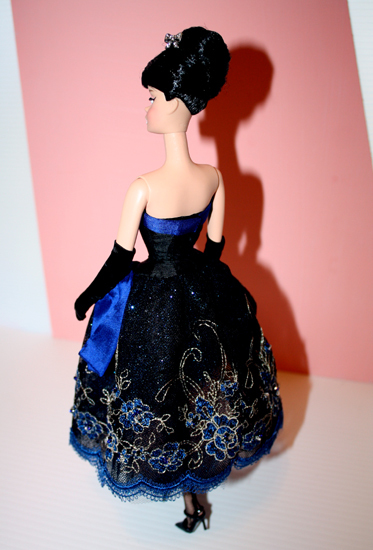 An extravagant bow in sapphire blue silk nestles on her hip. Long black gloves complete this dramatic look.